London - England suffered a major injury blow before the start of Euro 2012 next month after midfielder Frank Lampard was ruled out of the tournament with a thigh injury, the FA said in a statement on Thursday. Lampard pulled his thigh in training on Wednesday and was examined by the England medical staff following a scan. "It's a huge blow for the team, especially coming after the loss of another senior player in Gareth Barry. The fact that the doctor cannot guarantee Frank could take part in any of the group matches means we have to replace him in the central midfield area," said England manager Roy Hodgson. 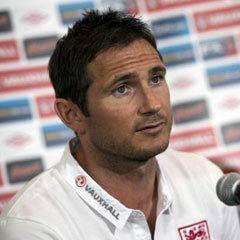 "Apart from it being a huge blow to me and the team, I'm especially disappointed for Frank himself. He has been in very good form and was looking forward to the tournament. He made a huge contribution towards us qualifying for the Euros so it is cruel to be forced out through injury just before the tournament." The FA said Liverpool midfielder Jordan Henderson will be called into the squad - subject to agreement from UEFA's medical team. Everton's Phil Jagielka replaced Barry in the squad on Monday after the Manchester City midfielder tore a muscle in his lower abdomen during Saturday's 1-0 friendly win over Norway in Oslo. England play Belgium in a friendly at Wembley on Saturday and open their Euro 2012 campaign against France in Donetsk on June 11. Sweden and co-hosts Ukraine are also in Group D.